Every beach home requires a bit of maintenance. Consider the daily tasks of getting the mail, newspaper, altering the thermostat etc. 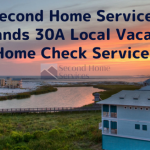 With our weekly home check services, you get all of this and then some, including changing the air filters and the batteries on smoke detectors. Return to your home and its valuable assets, intact and ready to be enjoyed.